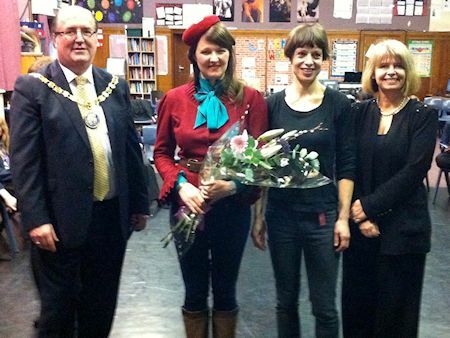 West Worcestershire MP Harriett Baldwin joined local school pupils in an event to mark Holocaust Memorial Day with celebrated singer Katy Carr. Harriett was invited to a class at Pershore High School last Friday (February 1) with Wychavon District Council chairman Richard Morris. The group were given a live performance of a song recorded by the singer about a young Polish boy scout who managed to escape from Auschwitz in Rudolf Hess’s car. Polish-born Katy was recently profiled on the BBC Radio 4 show Front Row about her current album which features songs about wartime Poland. Harriett commented: “It is important to continue to remember the terrible events that occurred in Europe more than seventy years ago. “I applaud Pershore High School and Wychavon District Council for putting on this event and teaching the children an important lesson in a memorable way.